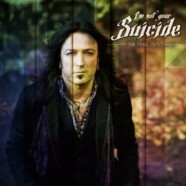 At long last, having been completed for some time now, Michael Sweet’s latest solo record, I’m Not Your Suicide, is set to be unleashed upon the world. Being the follow-up to Touched and the first solo full length of hard rock material since 2004’s Truth, expectations have been high and anticipation has been unbearable. With each and every solo album Sweet releases being produced to near perfection and not having released a rock solo record in 10 years, fans have heard for a few years now that a solo record was coming and with I’m Not Your Suicide, fans will not be disappointed in the least. Opening with “Taking on the World Tonight,” which features Tony Harnell of TNT, an ear-splitting siren wails over the speakers and it’s clear Sweet is taking no prisoners with this record and he’s back with a vengeance. The track could fit will on a Stryper record and is very reminiscent of his first solo record. “The Cause” is a lyrically simple track that has a deep meaning and features one of the most powerful vocal harmonies ever recorded and will give you chills. It wouldn’t be a Michael Sweet record without some beautiful ballads and we get those with “This Time” and “How to Live,” the latter of which Sweet wrote for his wife Lisa and features Stryper bandmates Tim Gaines and Robert Sweet. “This Time” fits right alongside ballads like “Honestly” and “All of Me” and features a duet with Audio Adrenaline/DC Talk vocalist Kevin Max, making for a combo of two of the most recognizable and unique voices in Christian music. Title track “I’m Not Your Suicide” would fit beautifully on the Real record and features one of the most catchy guitar lines Sweet has ever been a part of and created and will be stuck in your head for days on end. I’m Not Your Suicide is by far the most diverse and eclectic record Sweet has ever recorded and that’s never more evident than on “Coming Home” and “Heart of Gold,” which have a country-esque feel to them. Don’t let that alarm you, though, and don’t count the tracks out before you hear them because there’s still the hard rock feel to them as well. “Heart of Gold” being a cover of Neil Young’s classic track, Sweet has added an edge and punch to the song that wasn’t there before and has transformed it into even more of a masterpiece than it was in the first place. Then there’s the bonus track, which is a second version of “Heart of Gold,” which features Electra Mustaine, daughter of Dave Mustaine, in one of the most beautiful and gorgeous duets Sweet has ever done or been a part of. The two have such unique voices and complement each other so well that it makes for a moving and overwhelming experience for the listener. “Anybody Else,” which features Chris Jericho and Dough Aldrich, would fit well on any Stryper record and is To Hell With the Devil-meets-Against The Law-meets-Sweet’s self-titled record and is a great way to round out the record before we come to “Unsuspecting” and the “Heart of Gold” bonus track. In the end, I’m Not Your Suicide is the most musically diverse record Michael Sweet has ever recorded and released. Stryper fans will be surprised to hear some of the songs that lie within the record, but will be instant fans with how powerful most of the content is. Often times Sweet’s guitar playing is overshadowed by his frontman role in Stryper but his solo career is a way for him to showcase is overall musical talent and it has never shown through clearer than on I’m Not Your Suicide. There’s literally something for everyone on this track. Whether you like hard rock, metal, country, pop, or CCM, Sweet has something for you while still keeping his hard rock legacy at the forefront. He can still hit the high notes that very few can truly reach and Sweet has released the strongest solo effort of his career.